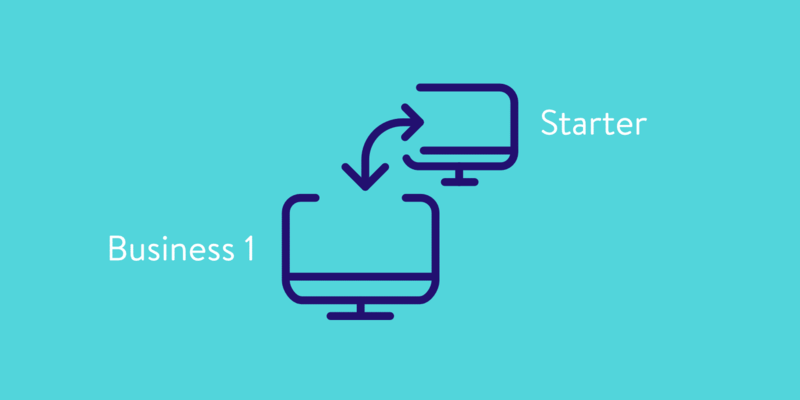 Whether you want to upgrade or downgrade, switching hosting plans at Kinsta is easy. 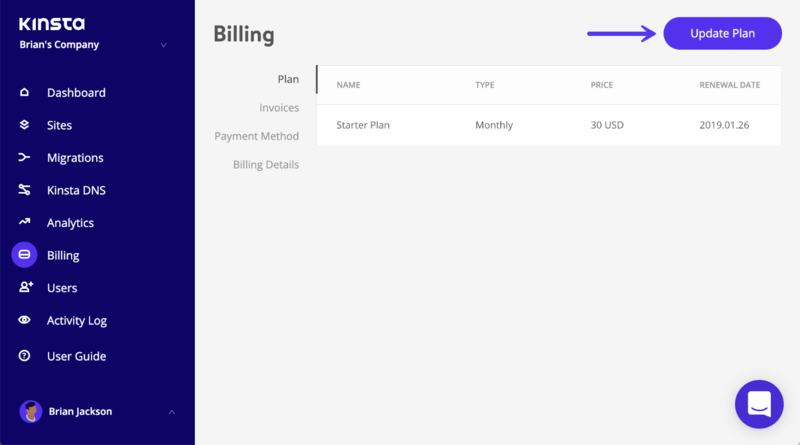 It can be done with a few simple clicks in the MyKinsta dashboard, without ever having to reach out to our billing team. Follow the steps below. 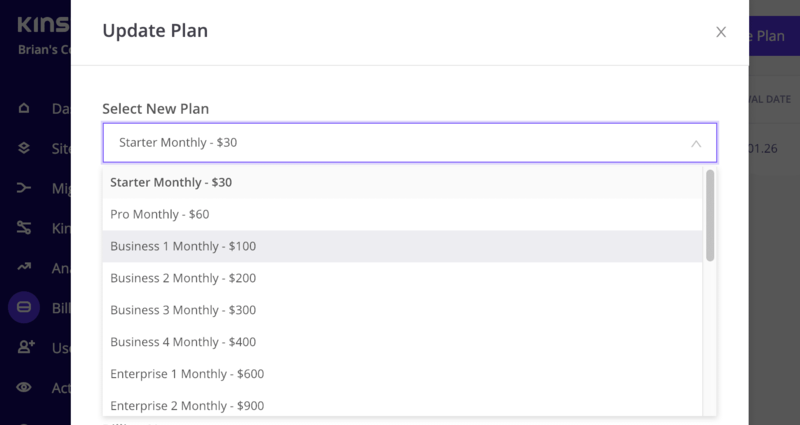 You want to take advantage of Kinsta’s annual discount (two months free). You need more disk space or are launching additional WordPress sites. You have a very demanding site and need additional PHP workers as recommended by our support team. Your website has become popular and you need to increase your visitor counts limit. You’re no longer working with a client and don’t need as large of a plan. You’re shutting down sites and are under the limits included in your current plan. Our system is prorated, which means we calculate the unused time on the old plan and the remaining time on the new plan within the 30-day or annual billing period. We use Stripe as our payment provider and the prorated amount is calculated down to the second. You can, in fact, upgrade or downgrade multiple times in a month and everything is automated on our end. Important note about overages: When you upgrade plans your new plan takes effect immediately from the time you make the change. If you’ve incurred any overages before upgrading those overages will still be applied to your next invoice. This is because when you upgrade plans your new plan is only in force going forward from the moment you make the change. The new upgraded plan is not applied retroactively. For example, let’s say you register for the Starter plan ($30 per month / basically $1 per day / allows 20k visits). Over the next 30 days, you get 100,000 visits which result in an overage of 80k visits. On the 30th day, you upgrade to the Business 1 (B1) plan. We would reimburse you $1 for the remainder of the Starter plan and charge you $3.33 for one day on the B1 plan. So before considering any overage, the total cost would have been $32.33 ($29 for 29 days on the Starter plan, $3.33 for one day on the Business 1 plan). You would then still be responsible for the one-time overage of 80k visits, which comes out to $80 ($1 / 1,000 visits). You sign up for a Business 1 monthly account and then decide to switch to a Business 2 monthly account 10 days into your current period. As long as the difference in the final amount due is lower than $100 there are no payments made at this time, the additional cost will be added to your next invoice. If the total amount due is increased by more than $100 we may charge the amount automatically. Plans are always paid for in advance so your next invoice also contains the full price of next month's Business 2 plan, which is $200. You sign up for a Pro monthly account and then decide to downgrade to a Starter monthly account 13 days into your current period. There are no refunds made at this time. Your next invoice(s) will be reduced by any credit amounted. Plans are always paid for in advance so your next invoice also contains the full price of next month's Starter plan, which is $30. How much time is left on your current plan. How much time is left on the annual plan. If you switched dead on the renewal date it’d be the full amount, otherwise, it’ll be less. The renewal date of an annual plan will be the same as your signup date. The only difference is that if you’re switching between monthly plans you aren’t charged until your renewal date but if you’re switching from a monthly plan to an annual plan you’re charged right away. Follow these simple steps to switch your hosting plan. Login to the MyKinsta dashboard. On the left-hand side click on “Billing.” Then click “Update Plan” in the top right. We also have 15% discounts on all plans for charities and nonprofits, as well as open source projects. However, these are not available in the MyKinsta dashboard. You’ll need to contact our support team. You can switch plans at any time, but the discount will need to be manually added on our end. Then click “Update.” Your new plan limits (number of sites, visitors, disk space, etc.) will then reflected within the MyKinsta dashboard. Note: You may need to do a refresh your screen. And of course, if you have any questions regarding switching plans, feel free to open a ticket with our support team. Each of our plans includes a predefined number of free migrations. However, these do not reset when you switch plans. For example, say you’re currently on B1 and you used your one included migration to move to Kinsta. If you later upgrade to B2 (which comes with two migrations), you will get one extra migration added to your account, not two. → How Do I Add a New Plan?